Keep cat your entertained for hours with the Mouse Chaser. It will give them hours of fun while keep them out of trouble. The Mouse Chaser will keep your cat occupied so you don’t have to worry about tearing up your curtains or scratching your furniture. It is an electronic cat toy that is battery operated for cordless fun and will keep your cat constantly entertained. The Mouse Chaser has a built in motion sensor so when your cat comes close, the toy mouse inside will start running around. When your cat stops moving so does the mouse. Your cat will try every way possible to catch the mouse inside. 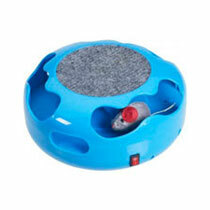 This will keep your kitty entertained and at the same time they are also getting exercise. Plus the top of the Mouse Chaser even features a built-in scratch pad your cat can use to maintain their claws. Each Mouse Chaser also comes with a bonus Laser Toy for more fun for your cat. Normally a single Mouse Chaser with the bonus Laser Toy is $19.99 plus shipping and handling. However with this current buy 1 get 1 free offer, you well get a second set for free. You just have to pay the extra shipping the second free set. That’s a total of 2 Mouse Chasers and 2 bonus Laser Toy.